There is an increasing trend towards performers writing their own CD liner notes. Indeed, so much has the ability to write programme notes become part of the soloist’s armoury that students at diploma and degree level are expected to write programme notes as part of their final assessment. Unfortunately, qualified and able teaching in this field is just about non-existent, with the result is that most students make a desperately bad job of it. In a way, though, they should not need to be taught this skill, for any serious student will, as a matter of course, have attended plenty of professional recitals and listened to countless CDs and will have read the notes supplied which provide an ideal guide to what is required. The trouble is, neither students nor teachers generally attend concerts or buy CDs, erroneously believing that the drivel available on YouTube is an adequate substitute (which it manifestly is not). It’s their loss, for while professionally-written notes bulge with worthwhile information and illuminating facts, the real gems come when artists write their own programme notes. True, most of them re-write musical history, adapt established facts to suit their own ends and issue a stream of wholly baseless justifications for their interpretastions, but with very few exceptions, what an artist writes to accompany their performance is both revealing and profoundly interesting. I have long urged students to include in their programme notes something which explains their particular approach to a performance. (I suspect that most Asian students, if forced, could do no better than something along these lines; “I use my fifth finger to play the E flat in bar 56 because my teacher told me to”.) When a diploma student asks me about the wisdom of pedalling Bach on the piano, or using just the toes when pedalling Bach on the organ, I advise them against trying to second guess what the examiner’s personal preference might be, and justify their own decision in the programme notes. A student who presented me with a diploma note which explained her ornamentation by saying that she had “listened to recordings by Joshua Bell and Yehudi Menuhin and decided that their ornamentation made no musical sense” immediately got me on her side, even if it did not always accord with my personal views on the matter. If only students tried to emulate some of the style found in artists’ notes, how much more entertaining the examining day might be. 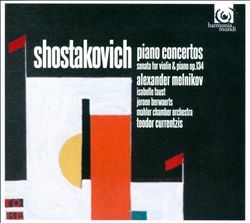 I’ve just read this glorious rant in the notes pianist Alexander Melnikov wrote to accompany his latest recording of the Shostakovich Piano Concertos on Harmonia Mundi (HMC902104); “The second movement of the Second Concerto is routinely included in ‘light classics’ compilations, broadcast by radio stations of dubious credibility and played through headphones to airline passengers or CAT patients to ‘make them feel good’.” (For my aprt, I have to confess I’ve never come across it once in this context, but that’s besuide the point!) Needless to say, having read that I find his performance (accompanied by the Mahler Chamber Orchestra and Teodro Currentzis) more thought-provoking than easy-listening. Pianists are particularly prone to writing their own notes, with Angela Hewitt giving ample rein to her belief in Bach’s viability on the piano and Stephen Hough doing his damndest to expunge any hint of criticism from those composers with whom he feels a particular empathy. Yuja Wang was alarmingly revealing with her assertion that Rachmaninov’s Second Concerto was really bad because it was hard for the soloist to make herself heard above the orchestra. Melvyn Tan’s wonderful comment that he wears certain expensive perfumes when playing certain composers’ music was far more insightful than a hundred words from a worthy musicologist. And one wonders how long it will be before Lang Lang pronounces to the world that he wears a Rolex for Chopin as it reminds him not to stray too far from the beat. All very interesting stuff which only an artist could get away with. The big regret with this growing tendency for soloists to write their own programme notes is that it has not yet passed on to conductors. Most conductors have a greater and more profound insight into the music they play than any humble instrumentalist; a minute spent discussing Shostakovich with Kees Bakels was worth a thousand words, the slurred utterances about Elgar from the late Richard Hickox in a Cornish pub after countless pints and glasses of wine were more valuable than a whole volume of Grove, and a two sentence email from David Atherton on Stravinsky were more revealing than all the volumes Stephen Walsh has turned out covering the finest details of the composer’s output. 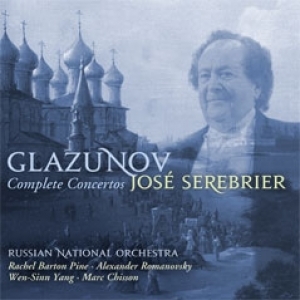 However, a wonderful double disc set on Warner Classics (2564 67946-5) of Glazunov Concertos - which has introduced me to the fantastic First Piano Concerto (1911), complete with its heavy re-working of the clarinet theme from Rachmaninov’s Second Symphony (1908), and an astonishingly Elgarian Cello Concerto (1931) - includes a compelling essay from conductor José Serebrier. We wander off the subject of the concertos rather a lot, but it’s well worth the detours; “Glazunov wrote his first symphony at 16: I wrote my first symphony at the same age and had it premiered by Leopold Stokowski the following year”, and “Neither Stokowski nor [Mischa] Elman was willing to travel across Manhattan for a private rehearsal of the Tchaikovsky Violin Concerto prior to that with the orchestra in Carnegie Hall. The maestro asked me to go to Elman’s home and annotate on his score how Elman played it”. None of which has any direct relevance to the music on the discs, but is both deeply fascinating and exudes a powerful sense that Serebrier is deeply rooted in the music he is directing. From anyone else such public riding of personal hobby-horses and blatant name dropping would be completely out of order, but coming from the artist they not only give us a feeling of the person behind the playing, but give an intriguing insight into the background to the performance itself. I’ m not sure students should ever carry things that far in their notes, but it certainly beata the “Shostakovich-is-a-modern-composer-who-writes-music-in-a-modern-style” school of thing we usually get to see. Dr. Marc, your departure from MPO marked my last purchase of a concert programme. No, that's not quite right -- I did buy one more and vowed never to squander that RM3 again. Your programme notes were informative, entertaining and memorable. I saved many of those programmes for years. Thank you!